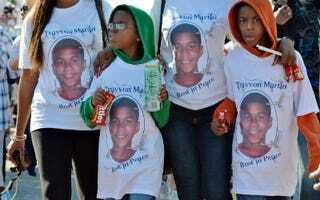 In a personal essay for ColorLines, Akiba Solomon introduces a young cousin who, if he were to walk around Trayvon Martin's Sanford, Fla.; Oscar Grant's Oakland, Calif.; or Sean Bell's Queens, N.Y., would likely be deemed "threatening." Like millions of others, I have been following the fight to bring George Zimmerman to justice for racially profiling, stalking and fatally shooting 17-year-old unarmed featherweight Trayvon Martin in late February. … At the risk of self-indulgence, I’m going to tell you that as the Martin horror continues I am grieving my own, seemingly unrelated loss. An aunt of mine, who manufactures sanity, joy, common sense and the wickedest jokes, is dying of lung cancer. I first cited this Maat-practicing, ‘hood eccentric sweetpea in an early column about black danger-womb billboards. Lately, while imagining the world without her in it, I’ve been worrying about her son. My cousin just turned 28 — the same age as George Zimmerman. When he was about five, this dark brown, big-eared child with hula hoop eyes drew on his clothes, made swords out of everything and cut the familial phone cord because he needed something to tie on the Superman cape he’d crafted out of a sheet. Yes, it would have been culturally acceptable for my aunt and uncle to beat some sense into this bonkers black boy. But they didn’t — she didn’t — because they wanted to preserve his spirit. Today, my cousin displays a quality too many black men I’ve met, liked and loved attempt to conceal: He has a sweetness about him. To be clear, he is not a “punk.” (You see how I have to put that in writing?) But he certainly doesn’t conform to prevalent media images of aggressive or feckless, extra macho and rigid, heterosexist and woman-juggling black men. Given his sweetness and profound weirdness, it would seem that my cousin would be exempt from the Bigger Thomas, O Dog or even Stringer Bell labels. Read Akiba Solomon's entire essay at ColorLines.